Shucked Oysters provide an easy and delicious way to enjoy fresh oysters in your next seafood recipe. Great fried, sautéed, stewed, bisque, frittered, in chowder, or as fantastic oyster puffs. Our Oysters are shipped in 16oz sealed glass jar shucked in their own liquor. You'll be sure to enjoy the rich texture, and slighty salty taste of our freshly shucked Oysters. Be sure to add some Jo Oyster Breader to your order for delicious fried oysters. Our premium oysters are great for a fantastic seafood dinner, Oyster bars, restaurants, or your next Oyster party! Oysters are not only delicious, but they're also one of the most nutritionally well balanced of foods, containing protein, carbohydrates and lipids. The National Heart and Lung Institute suggest oysters as an ideal food for inclusion in low-cholesterol diets. Oysters are an excellent source of vitamins A, B1(thiamin), B2 (riboflavin), B3 (niacin), C ( ascorbic acid) and D (calciferol). Four or five medium size oysters supply the recommended daily allowance of iron, copper, iodine, magnesium, calcium, zinc, manganese and phosphorus. The shucked oysters we sell are packaged in a sryrofome cooler with gel packs frozen at sub-zero temperatures. This means your Shucked Oysters will be well refrigerated until delivery to insure peak freshness. The oyster we sell are packaged in a sryrofome cooler with gel packs frozen at sub-zero temperatures. This means your Bay Oysters will be well refrigerated until delivery to insure they are live and fresh. Be sure to refrigerate or prepare your oysters to eat upon receiving your order. All of our Shucked Oysters are sold in 16 oz glass pint jars . Store in the coldest part of your refrigerator at least 40 degrees F.
Raw Shucked Oysters can stay fresh under constant refrigeration for up to 5 days. 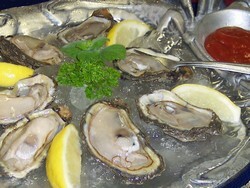 Oysters are considered low calorie, easier to digest than red meat, and high in vitamins. In general, 100 grams of oyster meat contains about 66 calories and 8.4 grams of protein, with only 1.8 grams of fat. By comparison, 100 grams of cooked ground sirloin has 408 calories, 22.2 grams of protein and 34.7 grams of fat.